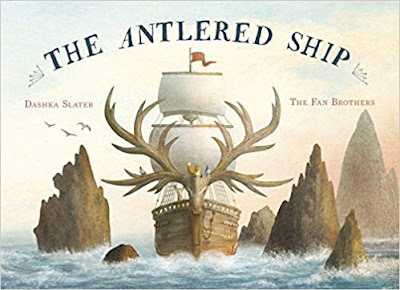 "The Antlered Ship" by Dashka Slater and the amazing Fan Brothers (Eric and Terry) is a visual feast for the eyes, but the story is also amazingly imaginative and dreamy too. It actually starts out with a humble fox called Marco. Marco is never satisfied with the slightly "Meh" answers he gets back from his friends and family to all his questions. And Marco REALLY does ask a lot of questions. Why do some songs make you happy and others make you sad? Where does the sun go when it goes down? And why do birds have such weird lizardy feet! Restless Marco spies a ship on the horizon one day. Just the start of a life-changing adventure! One day, restless Marco spies a ship arriving at their tiny island, and rushes to greet the crew. Perhaps they'll be able to answer his questions. But it soon becomes apparent that the deer crew are not only hopelessly lost, they could really use a hand. So plucky Marco seizes his chance to join them, see the world and perhaps find other foxes out there who might be able to help him with his thirst for knowledge. Along with a rag-tag group of Pigeons who also fancy themselves as globetrotting explorers, Marco joins the crew and soon they're off aboard the Antlered Ship, heading towards an amazing adventure. Will you join our brave crew, young fox? There are rough seas to contend with, jagged rocks and fearsome pirates. But this crew is not to be underestimated, and showing how valuable it is for friends to work together, Marco soon manages to find their island destination along with his seamates. But will he also find answers too? Life at sea definitely isn't a picnic! This is such a beautiful story, a voyage of self-discovery for a young fox who seeks as many answers about himself as he does about the world around him. As you'd expect from The Fan Brothers it's an absolutely stunning book to look at too, with the muted palettes and glorious depictions of animal characters making you feel like you could almost step into the book to join Marco on his adventures. Daddy's favourite bit: A gorgeous story about learning your place in the world, your own self-worth and depicting that ever-present thirst for knowledge that all restless minds have. It's visually amazing too, so many beautiful scenes and special mention to the map which is just gorgeous. What a talented team Dashka, Eric and Terry are! "The Antlered Ship" by Dashka Slater, Eric and Terry Fan is out now, published by Lincoln Children's Books (kindly supplied for review).